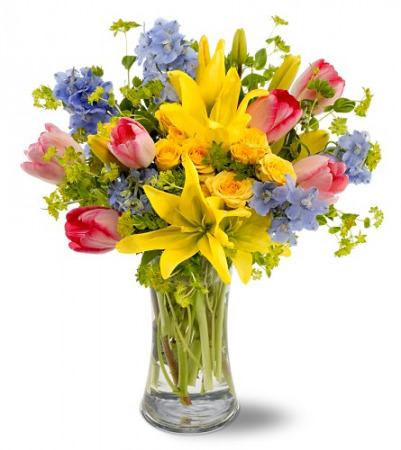 A beautiful gathering of spring flowers to bring joy and happiness to your celebration. With its distinctive appearance, it's no wonder that this topiary of sunny blooms is sure to brighten any room and bring smiles. 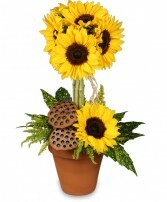 With an orb of sunshine at the top, this classic clay pot features the classic sunflower in all of its glory in a topiary structure with lotus seed pods emulating the sunflower's iconic brown spot. No matter the setting, this pot o' sunshine could sit at any end of a rainbow. Must be ordered 1 day in advance. 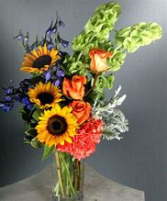 Sunflowers are always a great way to bring on the smiles. This is a very Enchanted design to fill anyones dreams with sunshine.